Hatsumoude is the ritual of visiting a shrine or temple for the first time following the beginning of a new year. January 1 is called Ganjitsu in Japan, and many people around the country flock to shrines and temples from late December 31 to welcome the new year. The method of prayer differs at shrines and temples, but during hatsumoude, people offer thanks for the past year and pray for safety and peace in the new year. 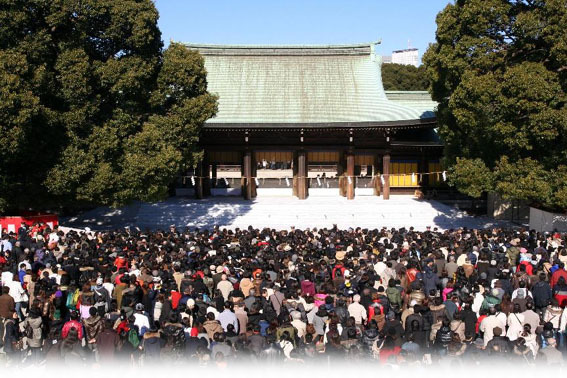 Meiji-jingu in Tokyo is a popular destination for many hatsumoude visitors from Ganjitsu until January 3 and is known to attract the most visitors in Japan, with over 3 million visiting the shrine dur- ing this time. Narita-san Shin- sho-ji in Chiba Prefecture and Kawasaki Daishi in Kanagawa Prefecture are also temples that attract numerous hatsumoude visitors. After praying during hatsumoude, many people buy a talisman or an evil-warding arrow called a hamaya. Another custom is to return one’s old talisman and hamaya that were bought the previous year. Some shrines and temples distribute sake (ricewine) to their visitors, which is claimed to keep misfortune away when consumed.